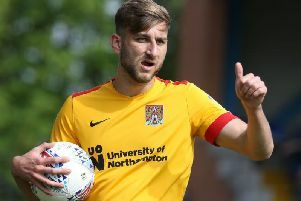 Cobblers loanee Joe Bunney was bailed out by his team-mates at the weekend when relegation-threatened Rochdale recorded a crucial 3-1 home victory over Scunthorpe United. Dale led through veteran striker Aaron Wilbraham early on but just two minutes later Bunney’s misdirected pass across his own penalty box gave Jordan Hallam a simple finish to equalise. The Town defender’s blushes were spared in the second-half, however, as Kgosi Ntlhe restored the home team’s lead before Wilbraham scored his second to secure three points, lifting Dale to within a point of safety in League One. Elsewhere, Town forward Billy Waters, on loan at Cheltenham, was ineligible to face his parent club and therefore remained on the sidelines for Saturday’s 3-1 defeat of the Cobblers at Whaddon Road. As for the club’s youngsters, Bradley Lashley and Jack Daldby both played for Wellingborough Town who went down 2-0 to Newport Pagnell Town, while Camron McWilliams was in action for Corby Town in their 2-1 loss to Bromsgrove Sporting. Matthew Slinn scored Cogenhoe United’s as they lost 2-1 against Deeping Rangers and Joe Iaciofano was a substitute for Banbury United during their 2-1 defeat to Biggleswade Town.